Why Choose a KOHLER Sink Faucet? Which KOHLER Faucet is Perfect for You? KOHLER is one of the top brands on the market when it comes to plumbing fittings and fixtures. Their toilets, tubs, and shower heads are best-sellers all over the country, and their faucets are huge sellers as well. In this special guide, we’ve taken a look at the whole KOHLER line! We’ll see what makes them special, and how they compare to the rest of the market. We’ve chosen three bathroom faucets and three kitchen faucets to recommend to you here. To narrow down the field, we compared features, specs, and all the key details of dozens of top models. We also took the time to read hundreds of reviews from previous buyers, to get a feel for what people thought about these fixtures after they’d used them for a while. In our own in-depth reviews, we’ll take you through everything you need to know about these models, and help you get a sense of which of them might be good fits for you and your home. The “Bold Look:” KOHLER fixtures certainly do have a unique style. While most models from competing brands fit squarely into categories (contemporary, traditional, modern, victorian), KOHLER’s fixtures tend to share elements of multiple styles. This helps them fit in more easily with different individual tastes, as well as your other fittings. American manufacturing: KOHLER is one of very few brands making faucets right here in the USA. That means better quality control, and better customer service. Smart features: Overall, KOHLER fixtures have a whole lot of smart features. The hoses in their kitchen models have swiveling ball joints and braided lengths to prevent kinks. They use seamless, ceramic disc valves to keep internal leaks away. They also use magnetic locks to keep pull down sprayers in place. There’s lots more to look at, but it’s these smart little design features which make KOHLER models stand out for us. Our most affordable recommendation for a bathroom faucet is this model from KOHLER’s Forte line. It’s a simple, elegant faucet with one central handle and solid build quality. We really like the smooth, curved lines and bright finish! While this is one of the least expensive KOHLER options, it’s built ruggedly. The faucet, handle, and fittings are all solid brass. The brushed nickel finish is tarnish and spot-proof. Previous buyers said they were extremely impressed by the weight of the fixture, right out of the box! This one also has a ceramic disc valve inside, for added durability. We prefer ceramic parts to plastic or metal because they’re much less likely to crack or chip over time. The smooth lines and curved design make for easy cleaning, since there aren’t many nooks and crannies for gunk to hide in. We love the little temperature indicator on the top, which seems to be missing from lots of new fixtures! We also love that the simple aesthetic works with both traditional and contemporary decor. The KOHLER will complement nearly any sink, so it’s a good style buy for most houses. The high arch design makes it easier to wash your hands, as well as rinse after brushing. The whole thing is ADA-compliant, which is always a big plus for us. You can turn the faucet on and off at any temperature. Many models require you to bring the knob back to center to switch on and off. It’s very efficient. The Forte has a 1.5 GPM flow rate, which exceeds both the EPA’s WaterSense recommendations and CalGreen state regulations for conservation! It works with 1-hole installations, or centered assemblies using the 4-inch escutcheon. That’s included in the package, so there’s nothing extra to buy. It also comes with a matching pop-up drain, so you can redo your whole sink at once. Even though this is one of the cheaper KOHLER models, it’s still pretty expensive. Some people reported leaky cartridges in faucets purchased a few years ago. This seems to have been corrected in more recent editions. For something a little more modern, try the KOHLER Alteo. It’s got a swooping, curved neck and dual handles for a low, graceful profile. We like the clean edges for modern, minimal decor, as well as for blending in with nature motifs. This model has a lot of the same features we loved on the Forte, with a bit more precision in the knobs. We love it for wider setups, especially for big countertop sinks. It’s just as well-built as the Forte. The Alteo is built from solid brass, with a brushed nickel finish that looks and feels very sturdy. The internal parts are even better! This one uses a ceramic disc valve, like the Forte. The Alteo betters the design by eliminating the washer. That gets rid of a key seam which can lead to leaks over time. It has two knobs. That gives you much more precise control over pressure and temperature. Finding the right balance is important with any faucet, but since bathrooms are much more of an intimate space, you want just the right feel for your morning and evening routines! You can space the knobs however wide you need. They’re both made from metal, just like the faucet head. That means they’ll last a lot longer than competing two-handle options. The big, high-arched spout gives you plenty of clearance underneath the tap for washing and rinsing. It’s super easy to install. The Alteo comes with a unified yoke platform for getting all the hoses hooked up and situated under the faucet. There’s also a pop-up drain, like you get with the Forte. Just like the Forte, the Alteo exceeds both EPA WaterSense guidelines and CA state CalGreen standards for water efficiency. It’s limited to 1.5 GPM, which saves about a third of the water from traditional faucets. We like that there’s an aerator built in, to make the flow feel just as strong as fixtures that use much more water. This model has a seam running along the spout, which can attract some gunk. However, we didn’t find any reviews reporting corrosion. It’s not going to work well for smaller sinks. The Alteo require a fair bit of space either side of the sink’s bowl. Some previous buyers noted that the aerator makes a fair bit of noise. The Fairfax is our top quality recommendation from KOHLER in the bathroom department. It’s an elegant, stylized faucet with some great design features and a really solid build quality. It’s stylish but understated, and a great choice for traditional decor as well as rustic looks. It’s old school. The Fairfax has some ornate touches and embellishments that help it fit with more formal, traditional decor. We also like the old-fashioned pump aesthetic, which works very well with rustic, old farmhouse decor! While we’re recommending the brushed nickel here, this one is also available in a bronze finish. We’re loving the oil-rubbed look, which looks old school without appearing worn! Just like with any faucet, we’re warning buyers away from the chrome version, which is much less heavy duty and more prone to leaking. It’s simple. The single handle design is easy to use, and doesn’t require much space to install. It’s ADA-compliant, just like the other models we looked at. There’s a temperature indicator on the top. These little plug buttons are interchangeable, so you can switch them depending on the setup of your piping. That’s a really nice touch, and is a little way to make the faucet much easier for everyone to use — especially your guests! It’s all-metal. Just like the Forte and Alteo, the Fairfax is made of solid brass, with an elegant brushed nickel finish. The handle and the fittings are metal as well, so there’s no weak point to let you down. That’s what you want from a top-shelf model, and we’re pleased to see that KOHLER hasn’t cut any corners. The inside uses a ceramic valve, just like the other models. It’s less expensive than some of the competition. This is one of the nicest KOHLER models for the bathroom. The low arc design doesn’t offer as much clearance in the sink for handwashing. This one probably isn’t the best choice for people who like to dunk their face or hair in the sink. 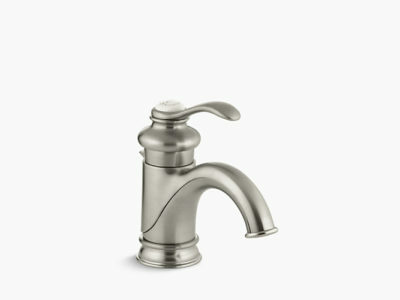 This Cruette model is our favorite affordable kitchen faucet from KOHLER. It has solid build quality, and lots of smart features for filling, rinsing, and washing around your sink. We particularly like the pull-down sprayer, as well as the 3-setting spray head. It’s well-made. The Cruette is solid brass, with a ceramic disc valve on the inside. It’s nice and high, with a sizable arc. This one gives you plenty of clearance above your sink for washing and filling large pots or plants. The spout swivels a full 360 degrees, so you have plenty of maneuverability. The spout also has a pull-down sprayer, so you can reach wherever you need. We like pull-down sprayers because they take up less space on the countertop, and are more durable than separate fixtures. We particularly love KOHLER’s pull-downs, because they have magnetic locks. When you retract the spray head, it’ll click back into place so that it never droops or sags! They’ve also added some smart touches to the hose, like braiding and a ball joint. These let you move around more smoothly than other models, which can build up pressure and kink awkwardly. It’s got the option of three spray settings. There’s your average stream mode, with an aerated boost to compensate for the efficient water use. Then, there’s a sprayer mode like you’d find on many pull-down models. We like KOHLER’s version, which gives you a blade spray rather than a rounded, more gentle spray. The flat edge is ideal for rinsing off dishes and pans, as well as cleaning down square sinks. The third setting is a “pause” mode, which lets you keep your temperature and pressure on hold for a moment without having to turn the water off completely. The spray head has KOHLER’s “master clean” nozzles, which are silicone nubs. We like them because they bend as you wipe across. That dislodges any mineral sediment or deposits which could lead to clogs and headaches. They’re easier to clean, plain and simple. The 1.8 GPM flow rate provides a good balance between economy and power. It’s not as restricted as a 1.5 GPM fixture, but it still saves lots of water over a 2.2 GPM fixture, which is the standard for EPA WaterSense ratings. Some previous buyers had issues with leaks after a few months. It’s a pretty small percentage of reviewers, so we’re assuming this was a case of a few lemons being shipped out. The buttons on the sprayer are pretty cheaply made. They’re little pieces of plastic, and a couple previous buyers said theirs ended up cracking. Some people didn’t like the blade sprayer feature. They said it was too aggressive, and caused some sprayback. We’d recommend turning the pressure down if that’s an issue. This Artifacts Series model combines a beautiful, classic look with the convenience of a modern pull-down spout! It’s as classy as any traditional fixture, but like a modern faucet, it still provides plenty of clearance underneath. This is a superb choice for a farmhouse or beach house look. We think it’s the best “classic” fixture Kohler makes right now! It looks fantastic! The Artifacts series is all about vintage curves, with slightly ornate touches around the joints and fittings. It’s a traditional look, but it’s not tied to any one period. We think it works wonderfully in either rustic or turn of the century aesthetics. If you’re into something a little less streamlined, and something more charming, this could be an ideal choice! There are several finish options to choose from as well, which helps you suit the Artifacts fixture to your specific aesthetic. The chrome version looks quite modern, without getting too close to minimalism. The bronze and nickel options have more vintage charm about them. Even though the curves and decorative aspects of the design make it look a little more squat than a plain arc, it gives you lots of clearance: a full 17″! We love that it combines an older look with modern practicality. This one has a single control knob for temperature and pressure, located to the side of the spout. You can easily switch the configuration for left or right handed people, or set it up with the knob at the front. Whatever floats your boat! It has an excellent sprayer! That’s another modern touch which you don’t normally find in a fixture which looks so classic. It pulls down from the spout easily, and has a wide angle and pressurized flow that’s superb for cleaning dishes. There are three sprayer settings to choose from. For rinsing fruits and vegetables, there’s a “Berry Spray” setting that uses thick, soft drops to rinse without damaging or bruising your produce. There’s also a straight-angle sweep spray for cleaning around your sink, or rinsing dishes to put in the dishwasher. And, finally, there’s also an aerated power option aerated power for filling pots, or cleaning messy pans. The sprayer head fits into the spout with magnetic docking, so it never hangs loose or sags. The swiveling ball joint and braided hose inside the assembly won’t kink or tangle like cheaper options. We’re impressed by the very smooth pull, as well as the effective counterweight. Like other Kohler models, this Artifacts one has an easy-clean sprayface. It’s resistant to mineral buildup and clogs, and you can simply wipe across it to dislodge any debris or composition residue. At 1.8 GPM, this meets modern water conservation standard for most of the country. However, reviewers were pleased to find they didn’t have any complaints about the pressure or output. Rather, most said it was even more effective than their older, more wasteful fixtures! It’s easy to install. DIYers said they had no trouble getting up and running, even without tools or plumber’s tape. Our top quality pick for your kitchen is the KOHLER Simplice. It’s got the most modern styling of our recommendations, and plenty of features to make it worth the extra cash. We love the bright stainless finish for matching appliances and modern lighting fixtures. It looks very modern. The Simplice is all sleek lines and styled curves, with practically no hard edges or ornamentation. It’s ideal for modern or minimalist decor. The Simplice is also unique in that the control knob isn’t actually located on the spout. It’s a separate unit, which looks like some matching soap dispensers. While this doesn’t really affect performance, it does mean your faucet is very unique. The high-arch spout rotates a full 360 degrees, so you can reach wherever you need to, or get it out of the way when you need access to the whole sink. The pull-down spray head is more compact than our other recommendations. The best part is, it still manages to pack in all the same functions that we loved on the larger heads. There’s a spray mode, an aerated flow mode, and a pause feature for quick stops and starts. Just like the Cruette, the spray mode on this one is a firm blade. It’s also just as maneuverable as the Cruette. The Simplice’s hose has a braided coating and swivel joint, and it’s got the magnetic locking feature, as well. It has the same master-clean spray face and spot-resistant finish as the other models. This one’s even better built. While all these models have all-metal bodies, this one has some good upgrades in the plastic parts, especially the buttons on the sprayer head. Some previous buyers reported issues with funky water coming out of their faucets. It was foamy and smelled of chemicals. That seems to have been an issue with the original supply lines, which KOHLER has since redesigned. The updated versions haven’t had any complaints. For the bathroom category, we looked at the Forte, Alteo, and Fairfax. The Forte is the most affordable option. We like the simple aesthetic, which works in nearly any design setting. It’s our recommendation to people who want something simple and no-nonsense. The Alteo is the best choice for people who have larger vanities or countertops in their bathroom. The two handle design covers a wider spread, and gives a more deluxe feeling. However, the Alteo is distinctly modern, so it doesn’t really work with older-style decor. The Fairfax is the best choice for people who are looking for a real heirloom piece. It’s the better-built model, and it has a classic look which lends style and elegance to a bathroom. We’re particularly impressed by its durability, with the all-metal construction and ceramic valve. On the downside, it’s pretty pricey. For the kitchen, we’ve looked at the Cruette, Forte, and Simplice. The Cruette is the least expensive model, and it has all the key features which we love about KOHLER faucets. We particularly like the blade sprayer feature for cleaning dishes and the sink after you’re done. It’s efficient, durable, and gets the job done. However, it’s not as stylish as the other options. The Forte is the most versatile choice for a few reasons. It has the most maneuverable sprayer, and the low-profile design blends into more types of decor than the other two models. We also like the added water power. On the downside, it has the most plastic parts, and isn’t as reliable as the other two. For the best of both worlds, power and versatility, features and durability, go for the Simplice. While it’s suited to more modern styles, the smooth lines and curves help it blend in with more traditional fittings, as well. We love that it includes all the features we love on each of the other two, in one package. Overall, KOHLER fixtures do carry a heftier price tag than some of the competition. The more expensive options tend to be 2-handle fixtures, as well as all-metal finishes like nickel and bronze. You’ll also pay more for smart features like magnetic docking and multiple spray modes. KOHLER fixtures are like any others when it comes to durability: you want to look for as many metal parts as possible. Look for brass-based finishes, like brushed nickel, stainless, or bronze. Avoid chrome if at all possible. Chrome usually ends up meaning plastic coated with metallic paint. It cracks quickly, and leaks almost every time. Real metal options are a bit more expensive, but worth it in the long run. On the inside, most KOHLER models are pretty similar. We’ve made sure to find models with ceramic disc valves, instead of plastic cartridges. They last much longer, and leak much less frequently. KOHLER’s big marketing campaign always cites their slogan: “The Bold Look of KOHLER.” Well, they actually have quite a few looks. The nice thing about a lot of KOHLER models is that all the designs are a bit ambiguous. They combine aspects of modern and traditional designs for something a bit more versatile and transitional. With that said, there are variations within the line. You’ll want to make a list of visual characteristics you’re looking for in your new faucet. Look around your space. Is it bold, stark, minimalist? Do you have more ornate decorations? Giving this some serious thought up front will help you find a fixture that actually lifts up your overall aesthetic, as opposed to just blending into it. Interested in seeing more from KOHLER? Check out the company’s best-selling models on Amazon! Or you could simply visit the company website at http://www.us.kohler.com/us/. For more kitchen faucets you could also check our homepage by clicking on kitchenfaucets.reviews.